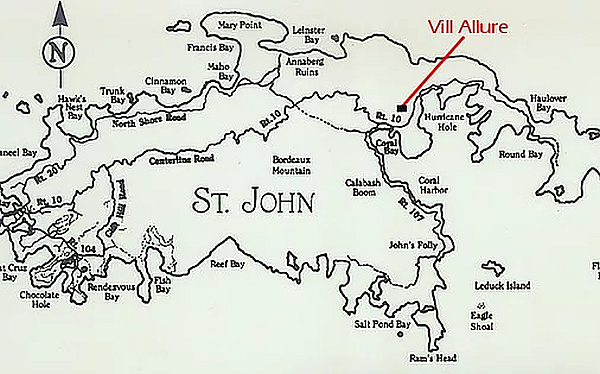 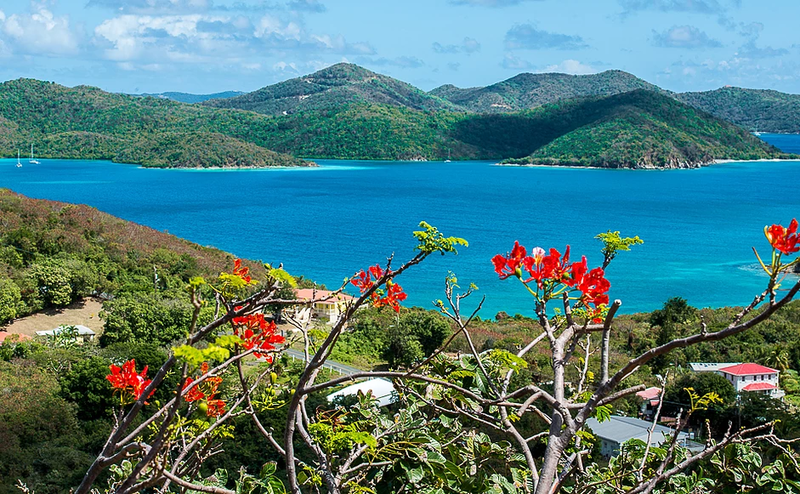 Located in Coral Bay, VillAllure commands magnificent water views of Hurricane Hole, a U.S. Virgin Islands national park treasure, with its pristine unspoiled shorelines and Coral Bay from 200’ above sea level. 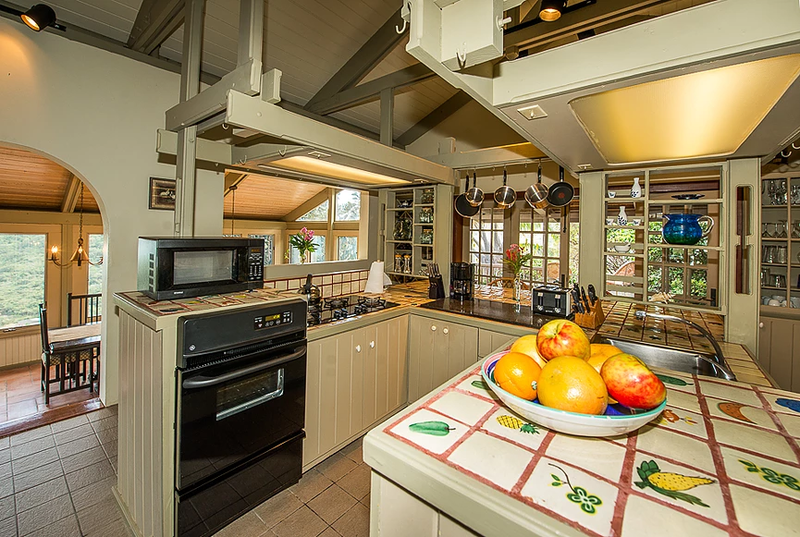 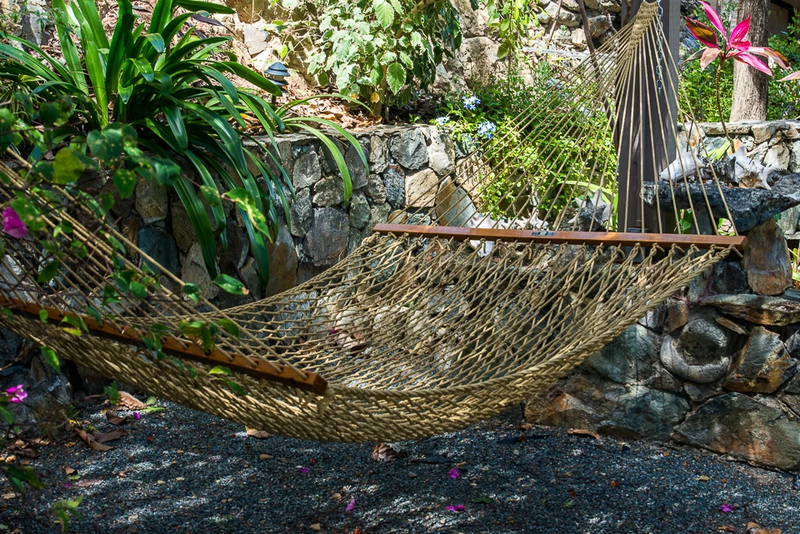 The house is nestled into a secluded ½ acre sloping parcel facing east, surrounded by a variety of mature native tropical plants and fruit trees. 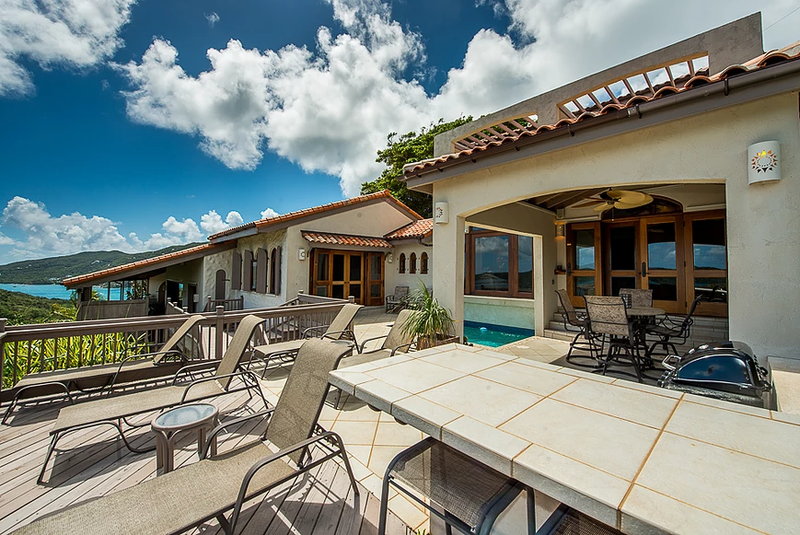 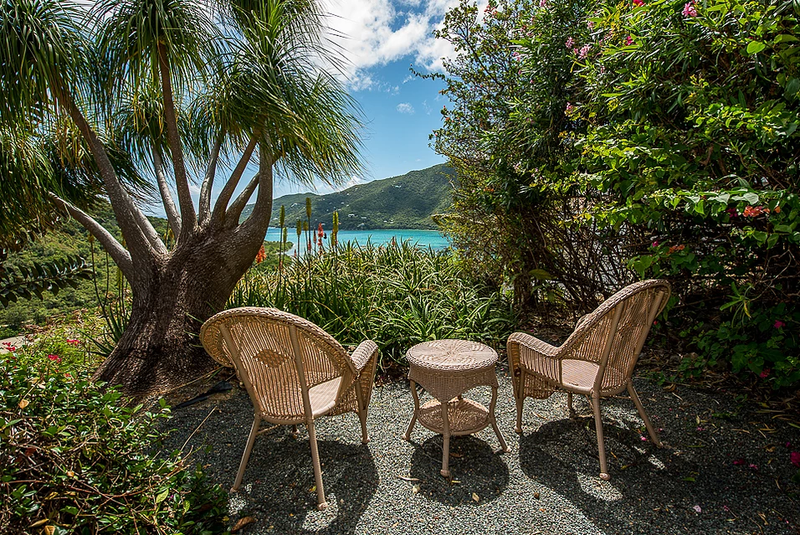 Ample off road parking for six or more vehicles provides convenient access while beautiful sunrises and gentle Caribbean trade winds enhance the relaxed and romantic atmosphere of villAllure. 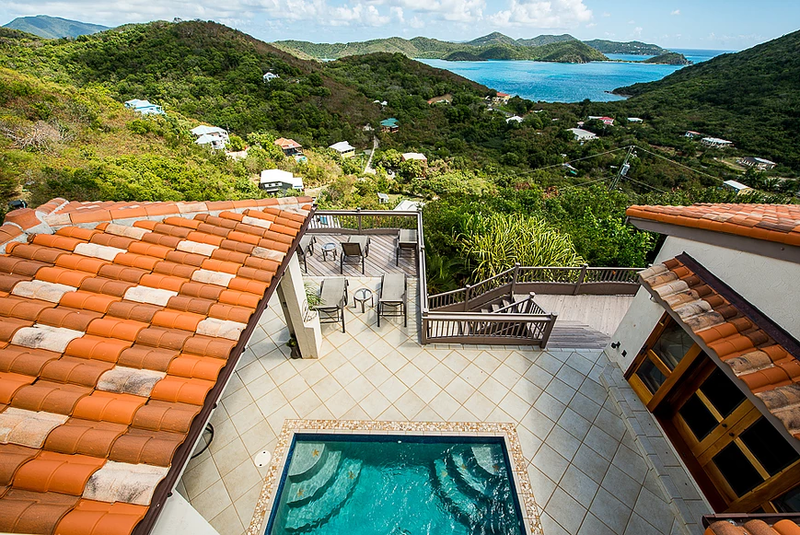 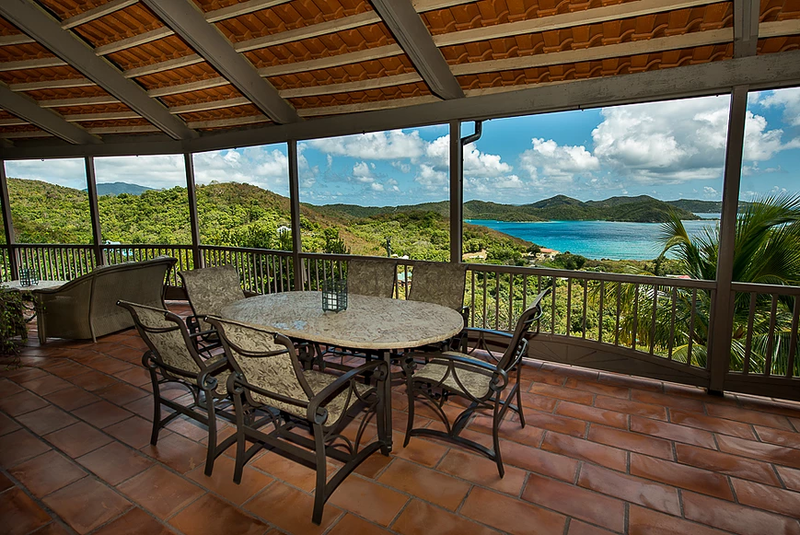 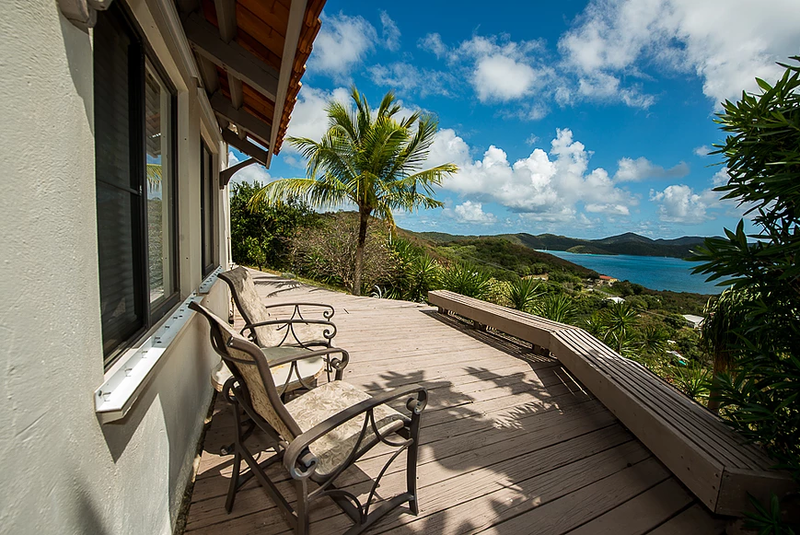 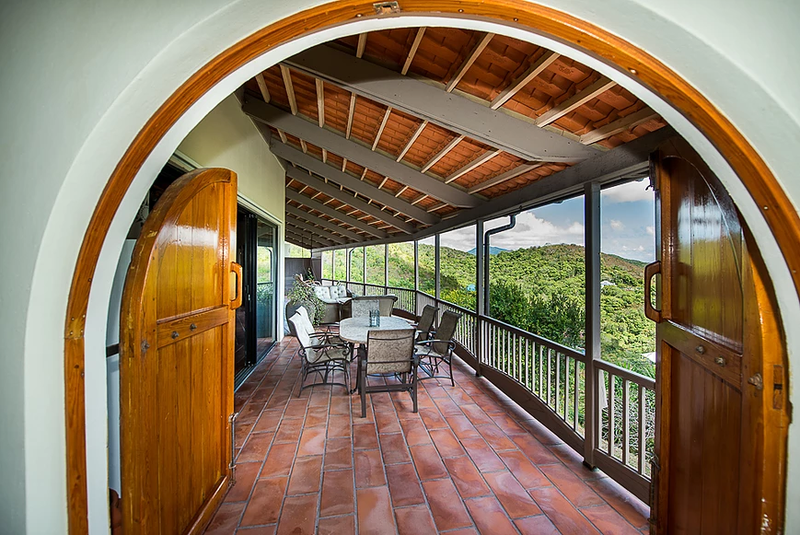 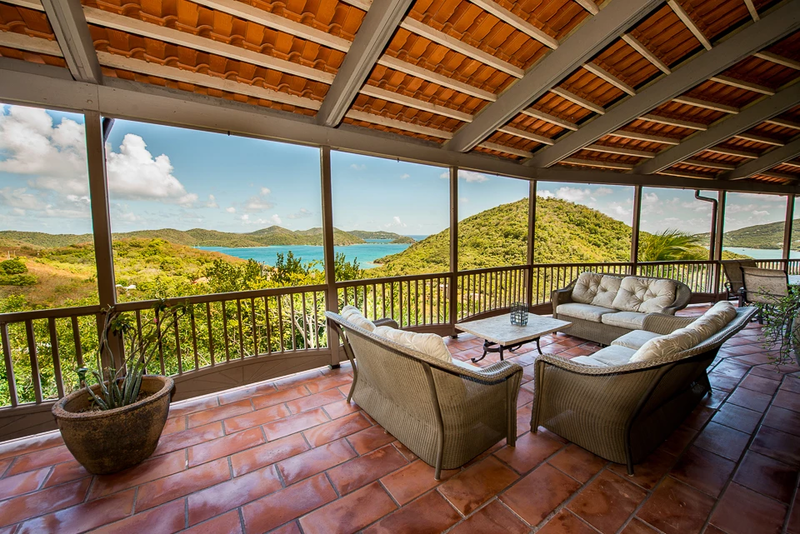 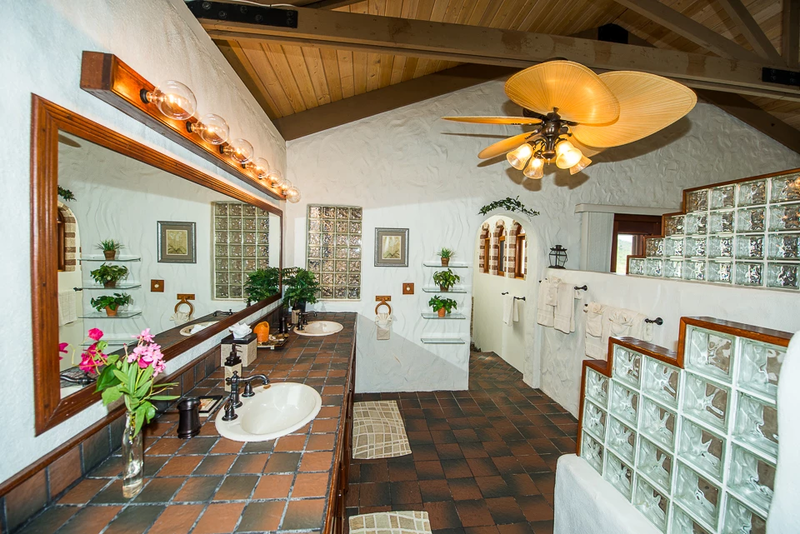 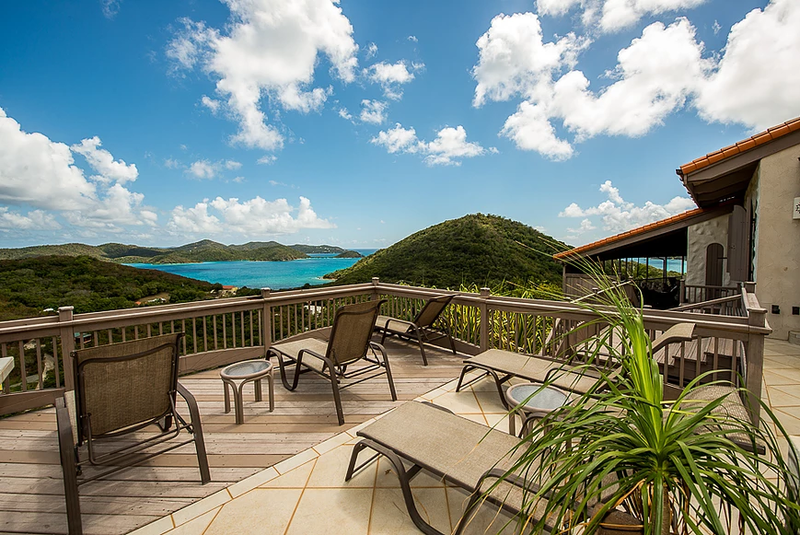 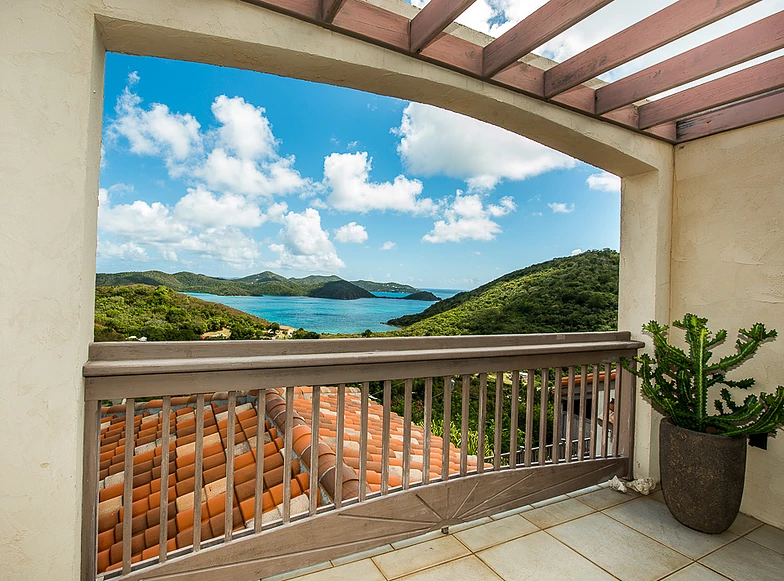 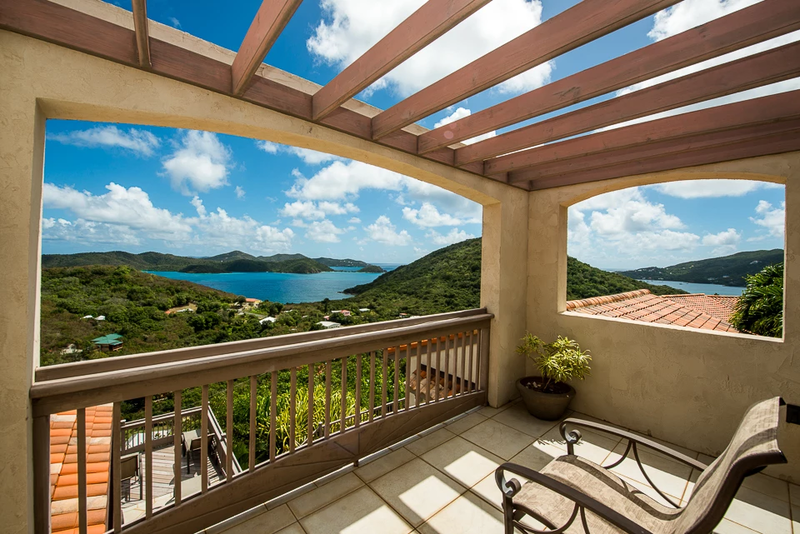 Capturing the natural beauty and romance of the Saint John U.S. Virgin Islands, VillAllure takes full advantage of the views and breezes while providing maximum privacy in the superbly intimate setting of a fine country home. 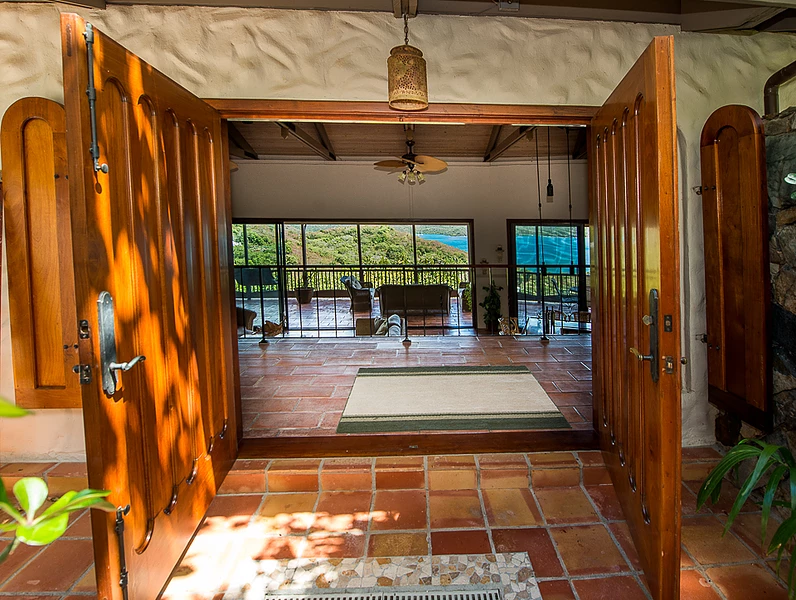 VillAllure’s main entry is gained thru a massive mahogany french door entranceway that overlooks a sunken great room with wet bar complimented by large glass sliding doors opening onto the large covered verandah framing a stunning view of the turquoise waters of Hurricane Hole and the Caribbean Sea beyond. 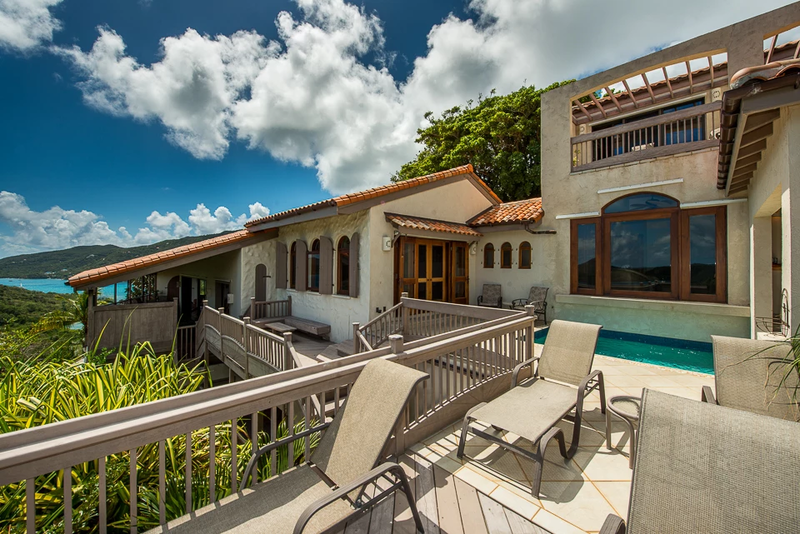 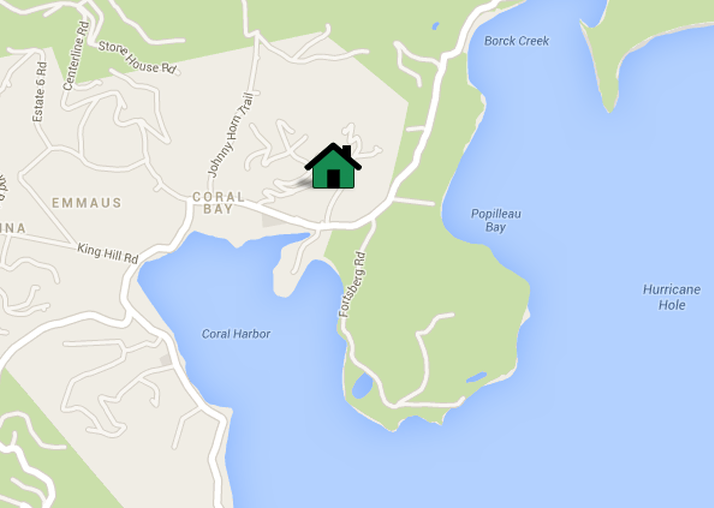 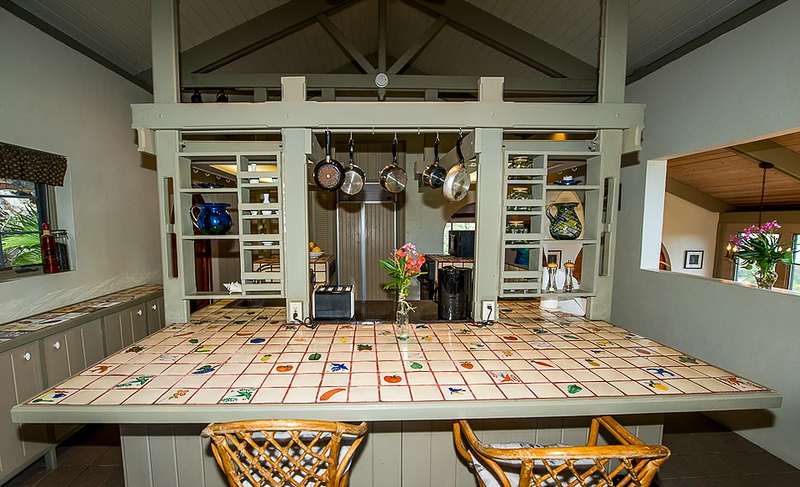 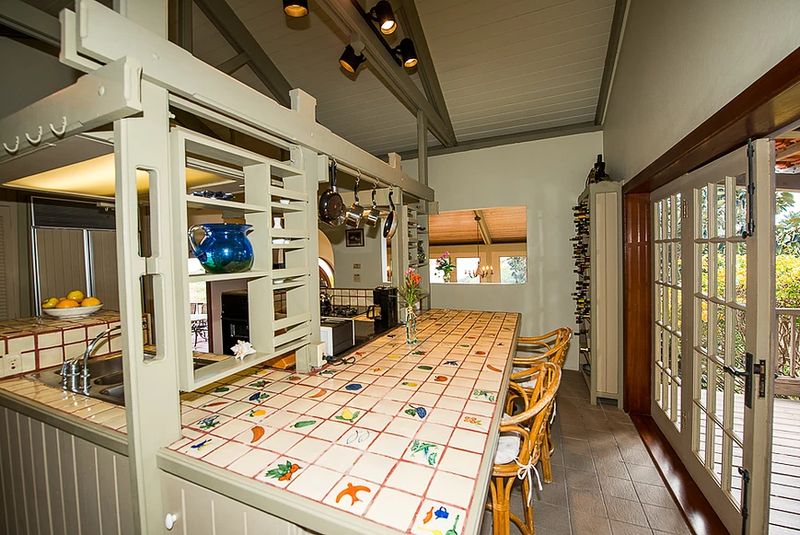 An open and airy kitchen is centrally located and perfect for casual dining or for preparing a gourmet meal to enjoy in the large formal dining room that overlooks Hurricane Hole to the east and Coral Bay to the south. 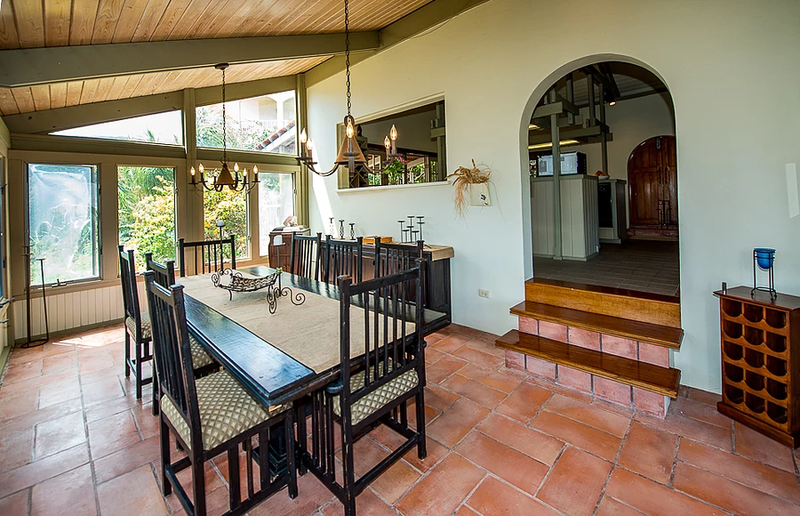 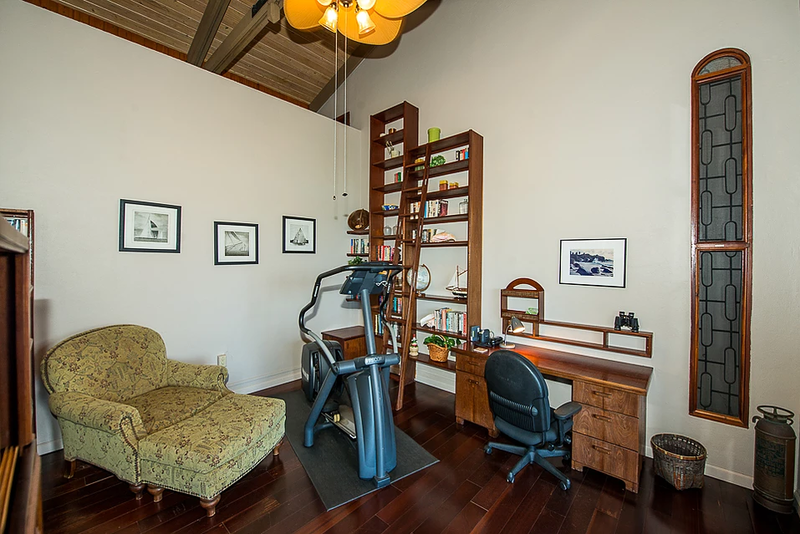 Features: Formal dining room with open access to the Verandah. 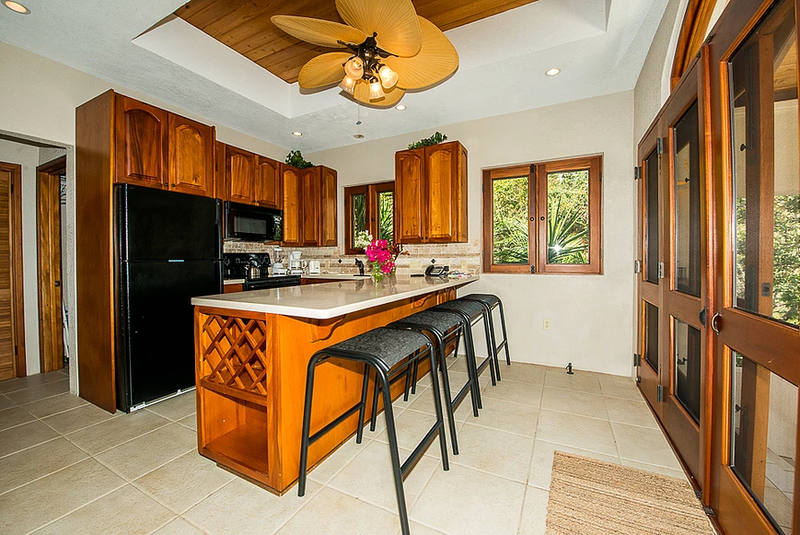 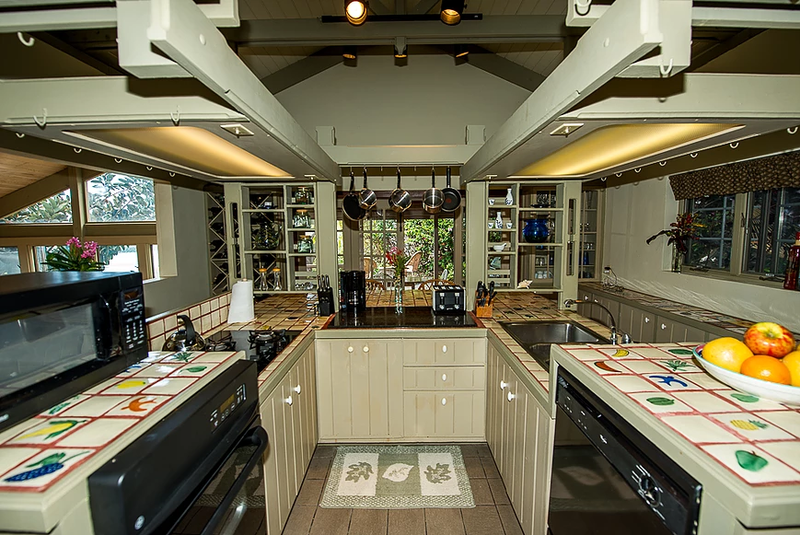 Gourmet kitchen with dishwasher, microwave, large refrigerator. 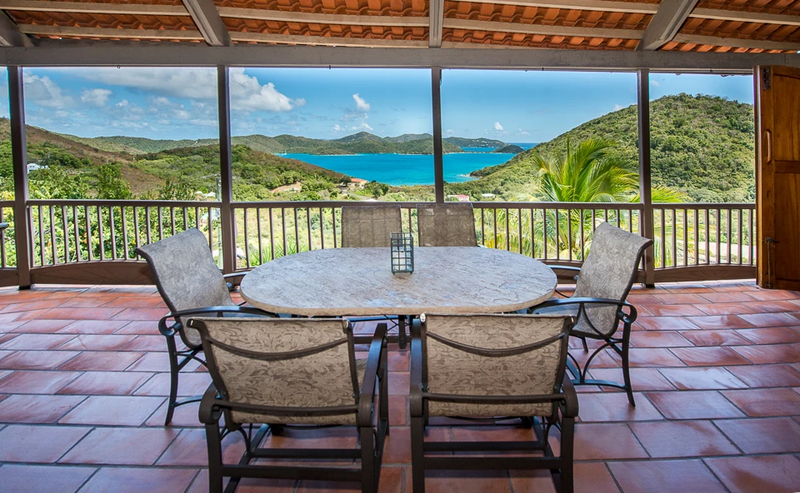 An expansive covered deck area provides plenty of shade throughout each day beginning with magnificent views of the sunrise and ending with the softly colored clouds reflecting the gentle sunset while framing the pristine waters of the Saint John National Park Bay of Hurricane Hole. 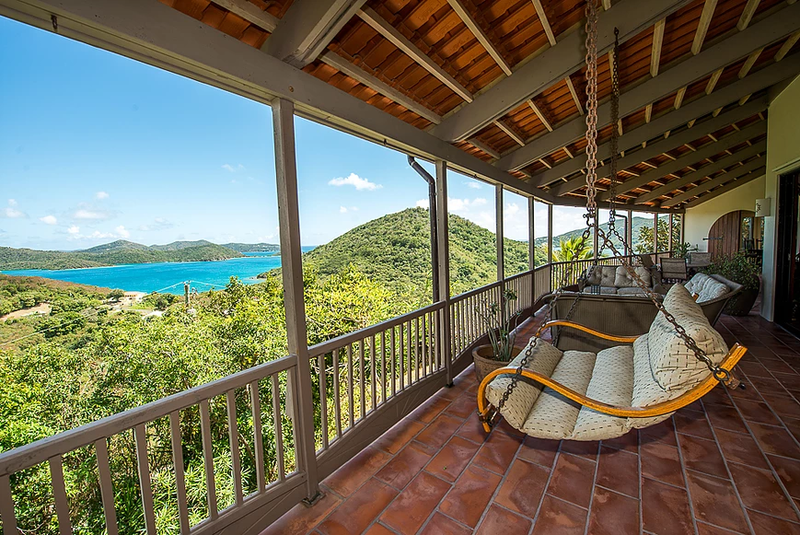 Features: Porch Swing with access to pool, dining and kitchen area. 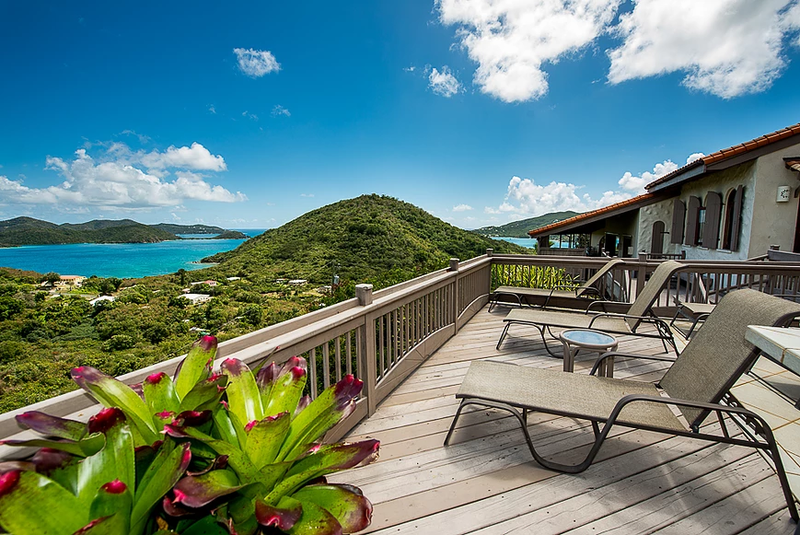 WITHIN 30 DAYS OF ARRIVAL ONLY! 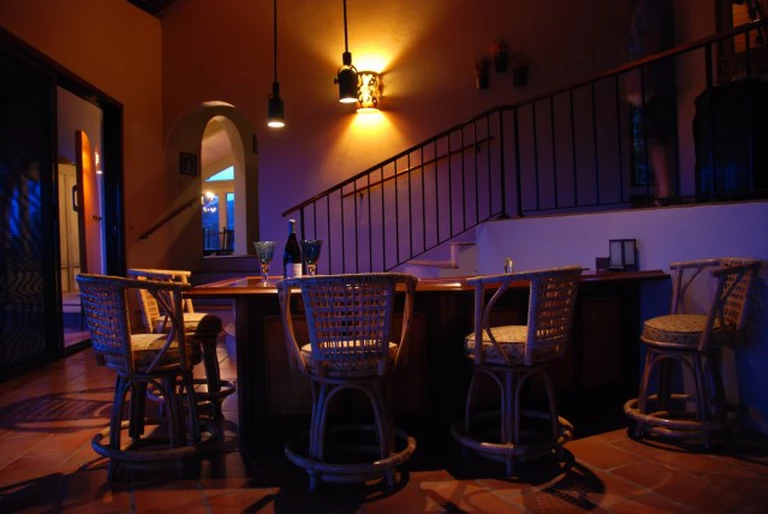 or speak to Karen to make a reservation now. 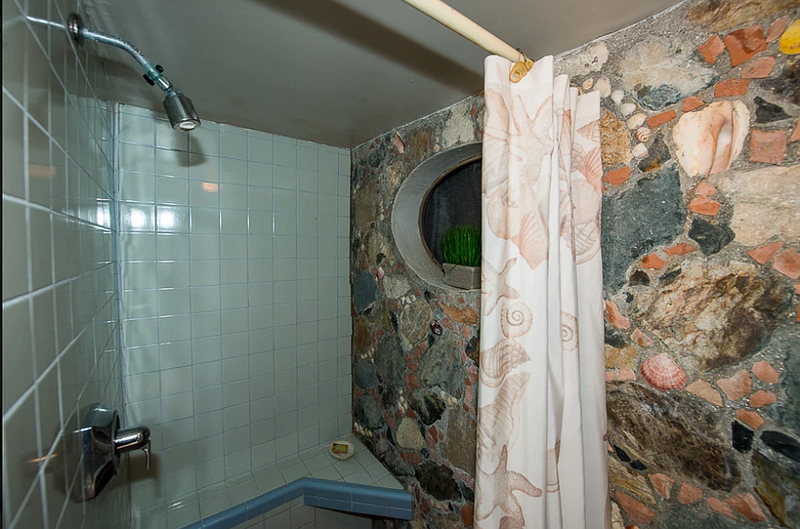 VillAllure is a non-smoking location and is not recommended for travelers under the age of 8.
by a small fish pond with waterfall all accented by dramatic lighting for nighttime enjoyment. 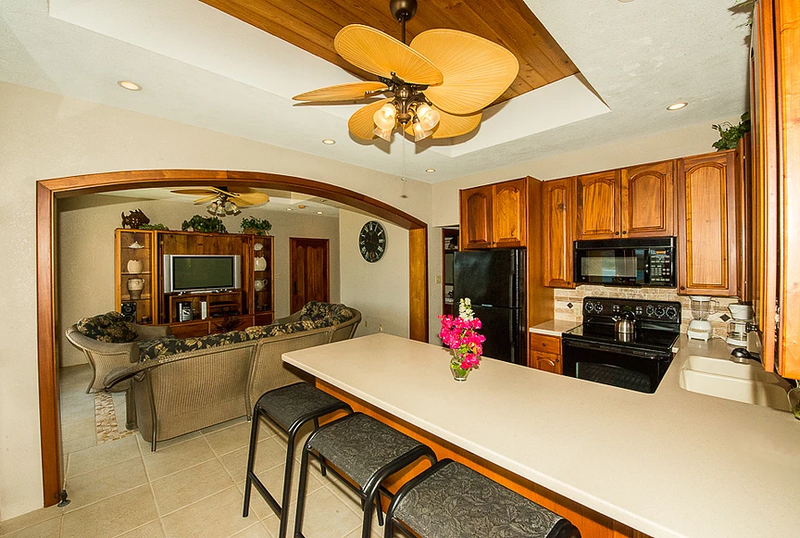 VillAllure’s private poolside entertainment area boasts a full kitchen accented by a dramatic mahogany archway as well as handcrafted mahogany kitchen cabinets and entertainment center, 1/2 bath and full laundry. 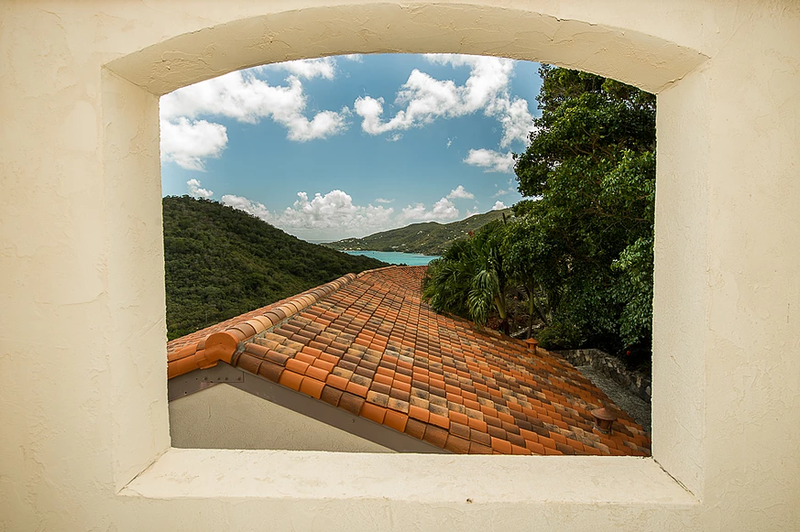 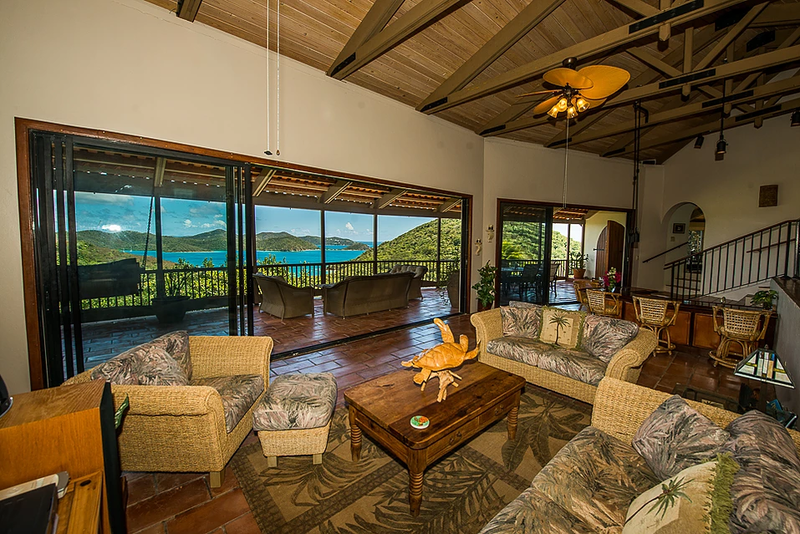 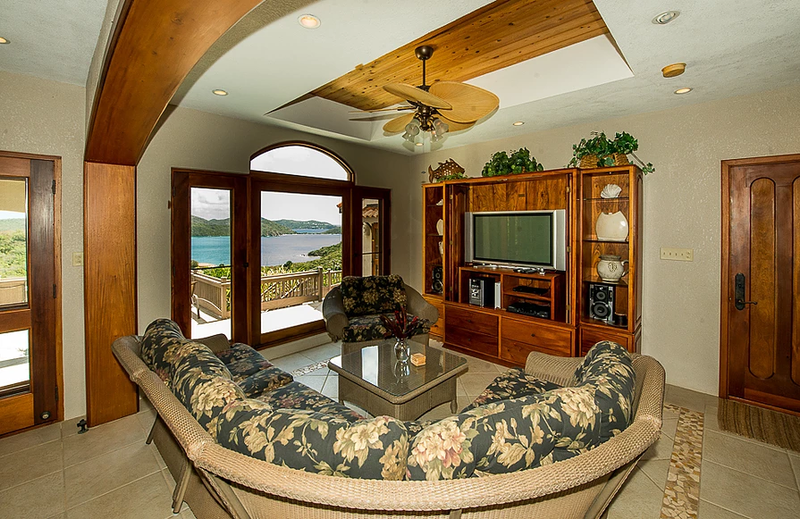 A large mahogany picture window overlooks the swimming pool and surrounding sundeck as well as Hurricane Hole and the east end of St. John in the distance. 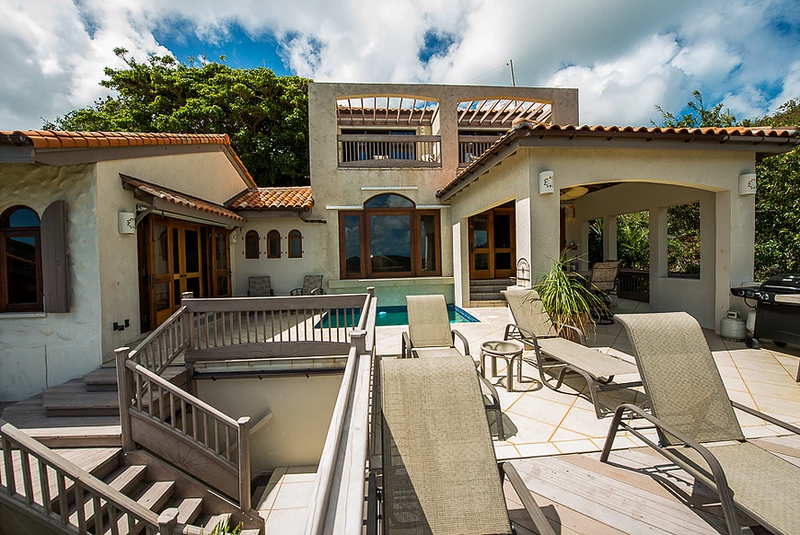 A single mahogany entrance door provides a private access to the poolside living space. 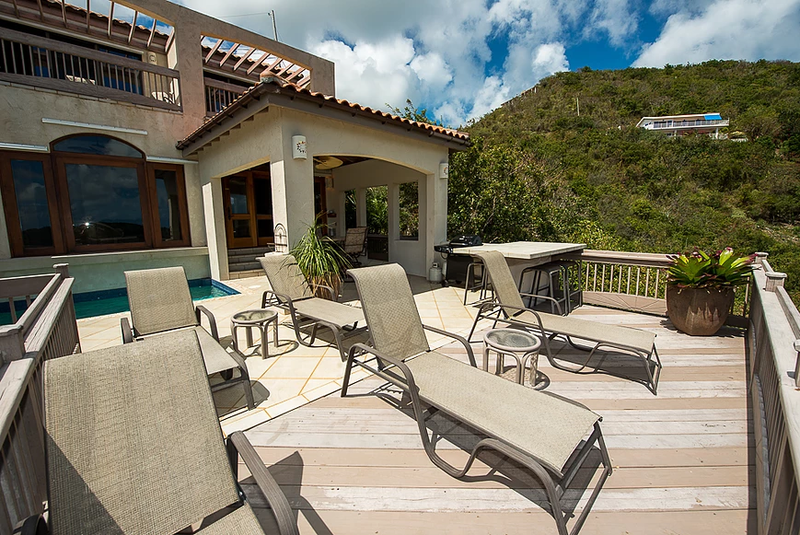 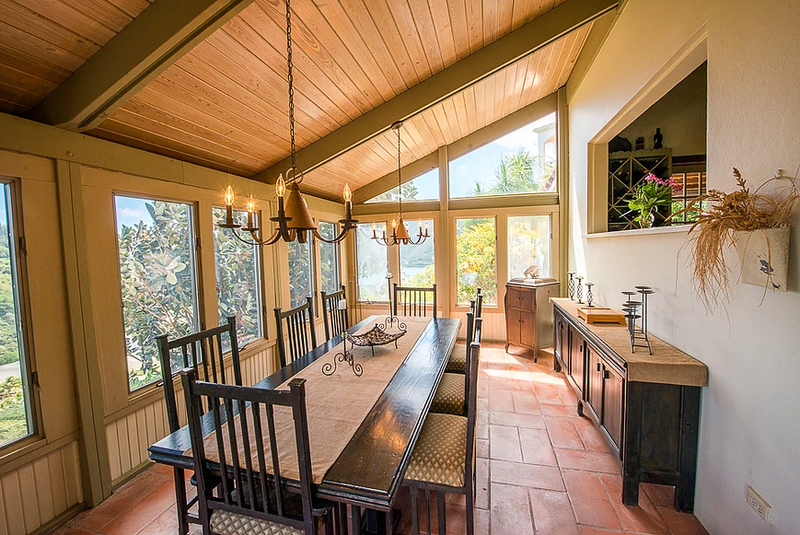 Screened mahogany french doors exit the kitchen area onto the adjoining poolside verandah, secluded pool and sundeck. 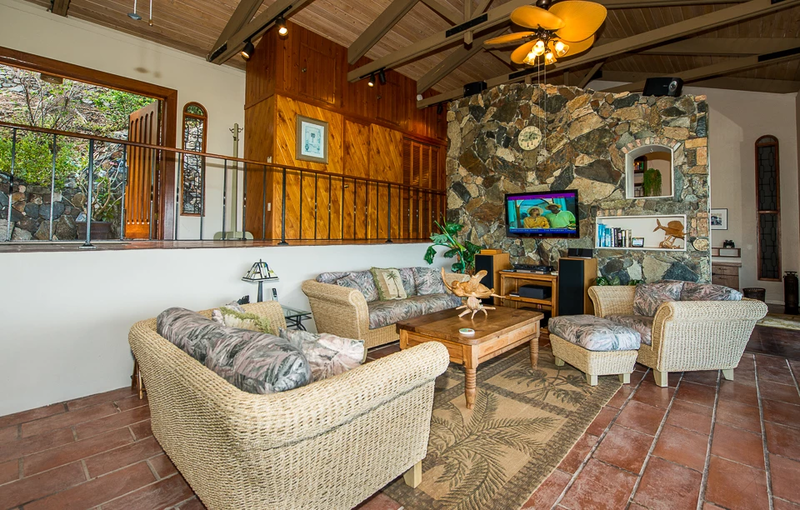 Comfortable and secluded with sun and shade to meet your desires, this entertainment area is a favorite for guests. 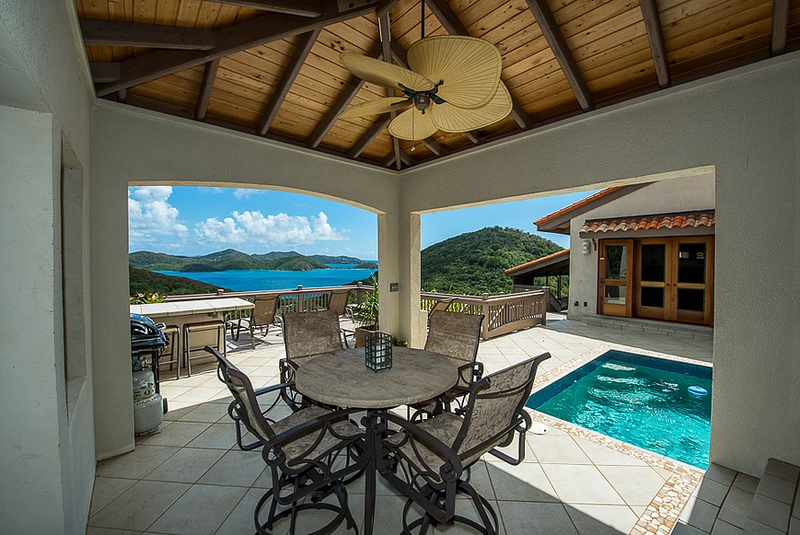 The 12’X14’ pool is adequate for cooling off while having your favorite cocktail and the adjoining verandah provides relief from the sun while still enjoying the gentle Caribbean breezes. 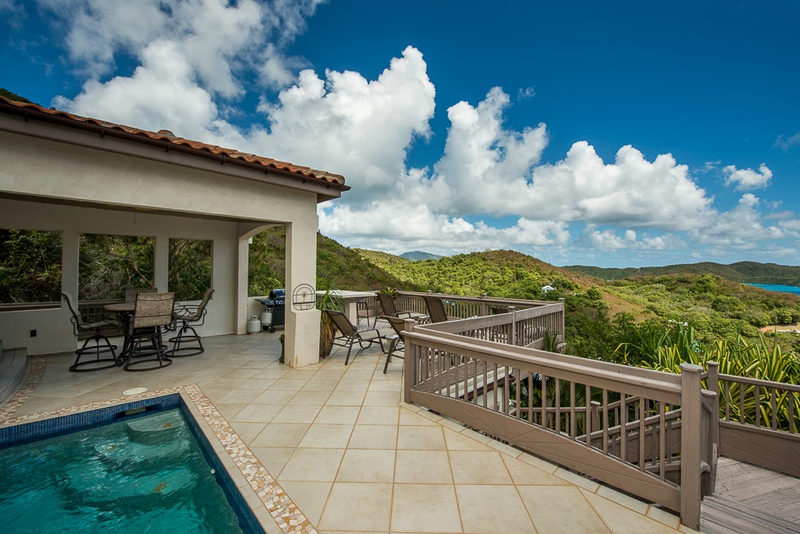 The views from this area of villAllure speak for themselves! 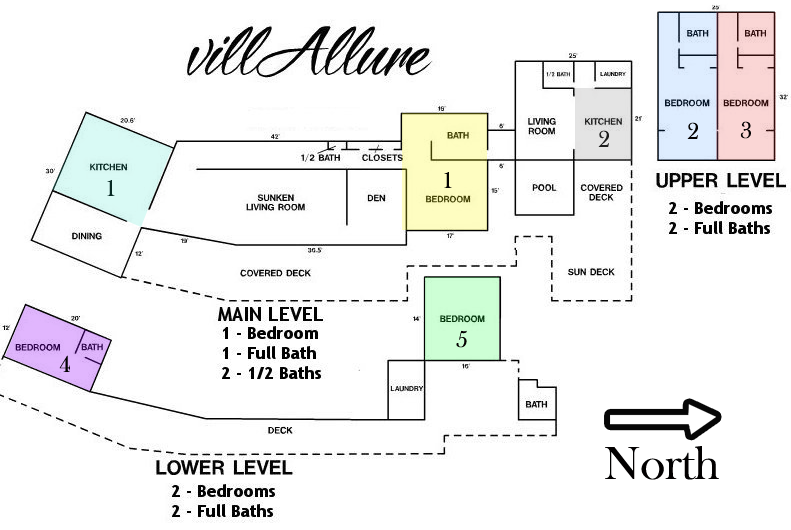 You deserve to be HERE!! 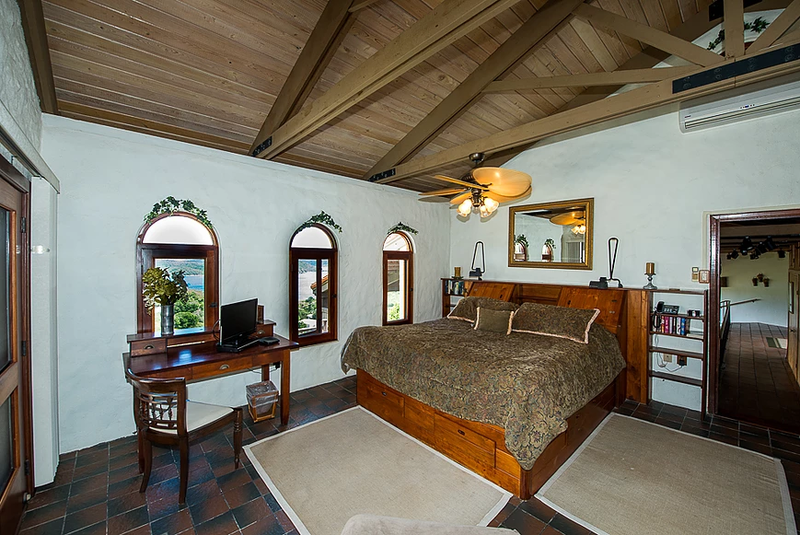 The stately master bedroom on villAllure’s main level is accented by a custom built-in mahogany king size bed with shelving, walk-in garden shower, three arched windows facing east with a dramatic view of Hurricane Hole, rustic plaster walls and screened mahogany french doors opening onto the pool deck area. 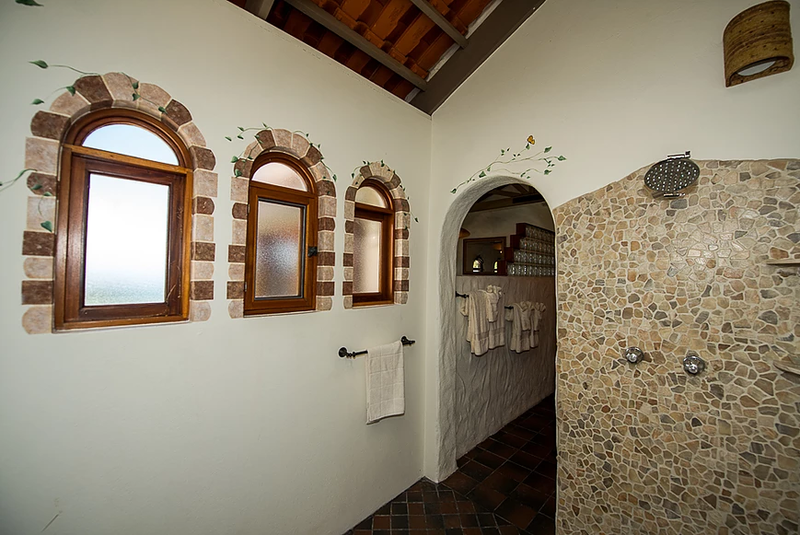 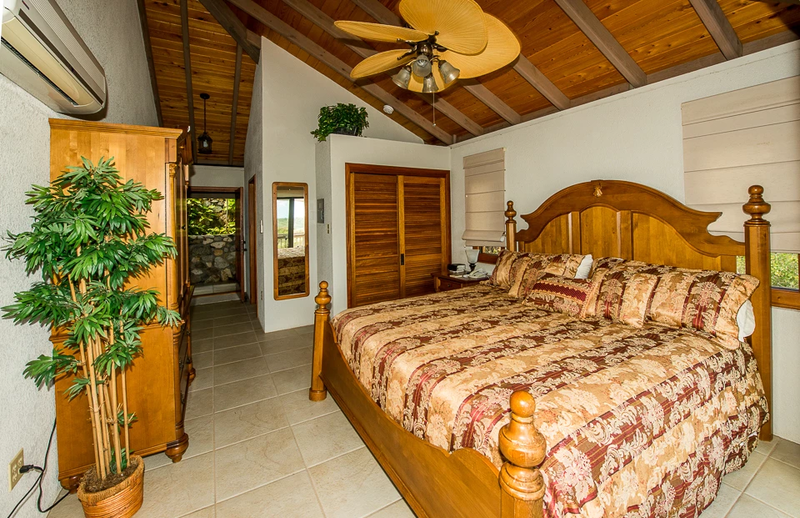 Handsomely decorated and roomy, the upper bedrooms are equal in size and appointments with private entrances, spacious bathrooms with tiled showers, king size beds, mini fridges and private balconies with spectacular views of Hurricane Hole. 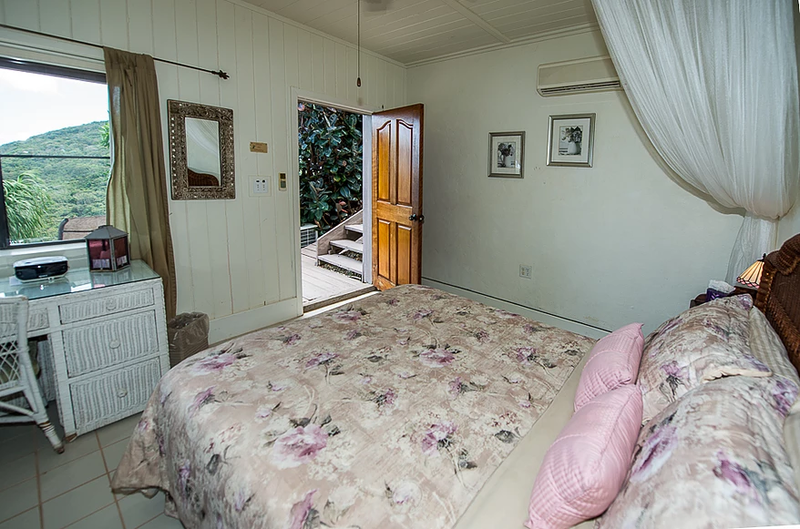 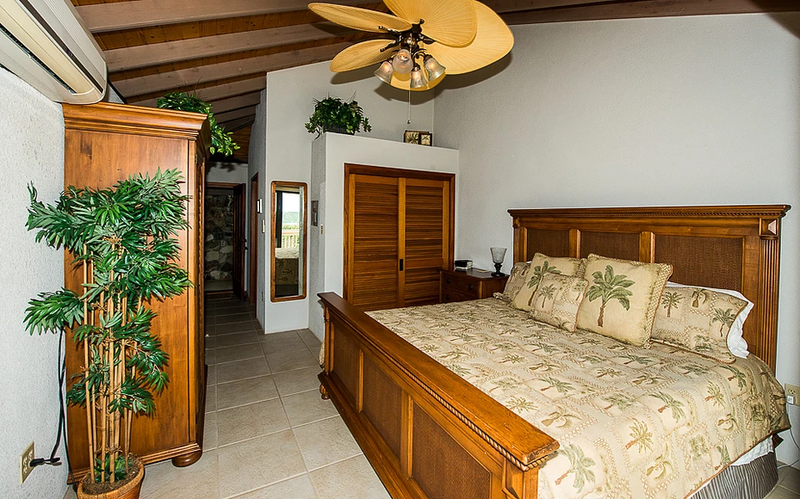 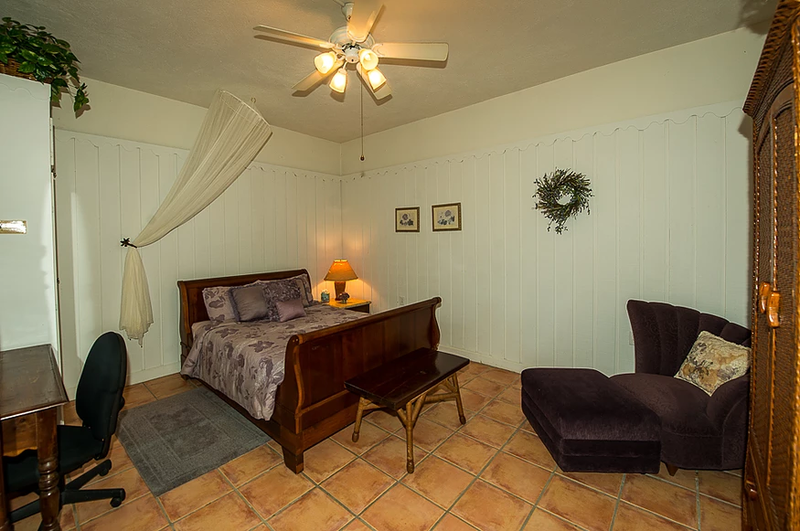 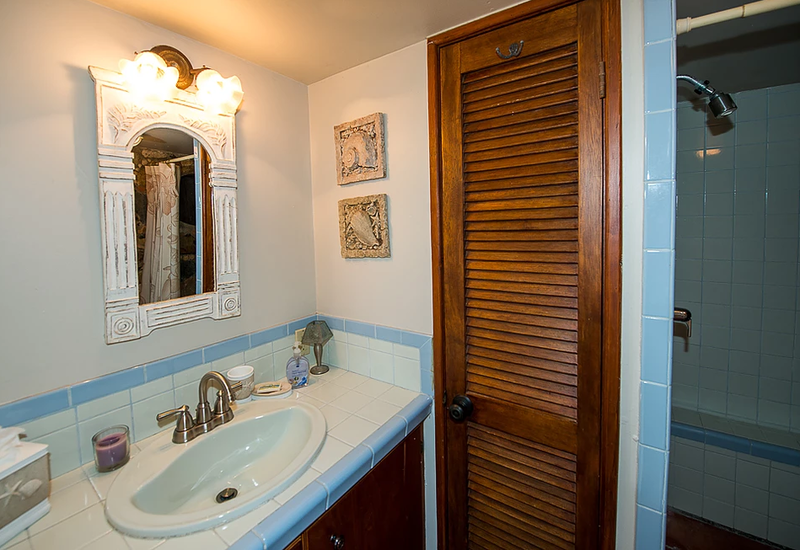 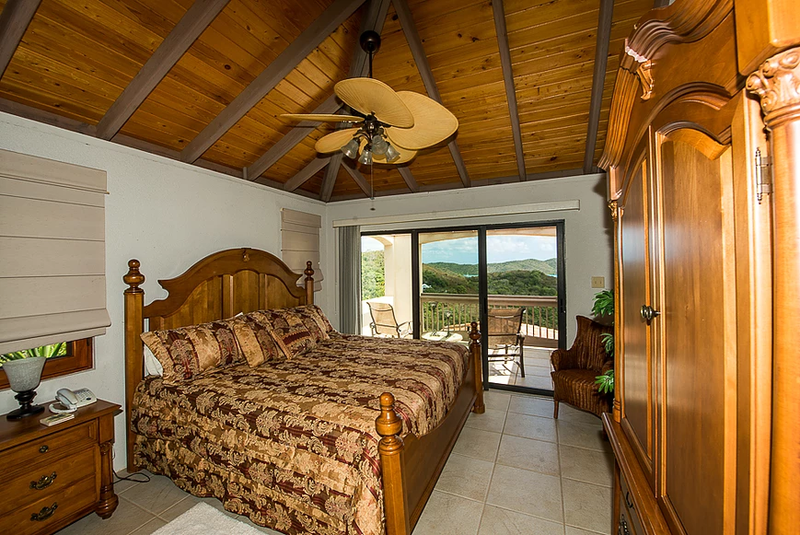 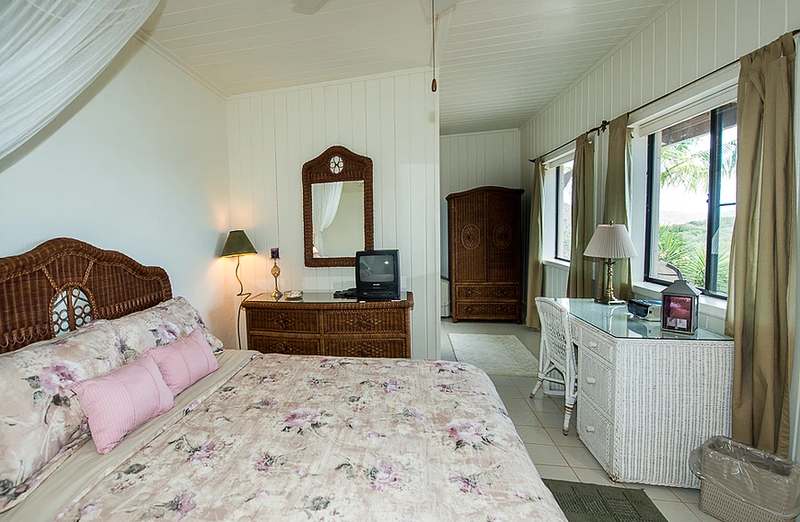 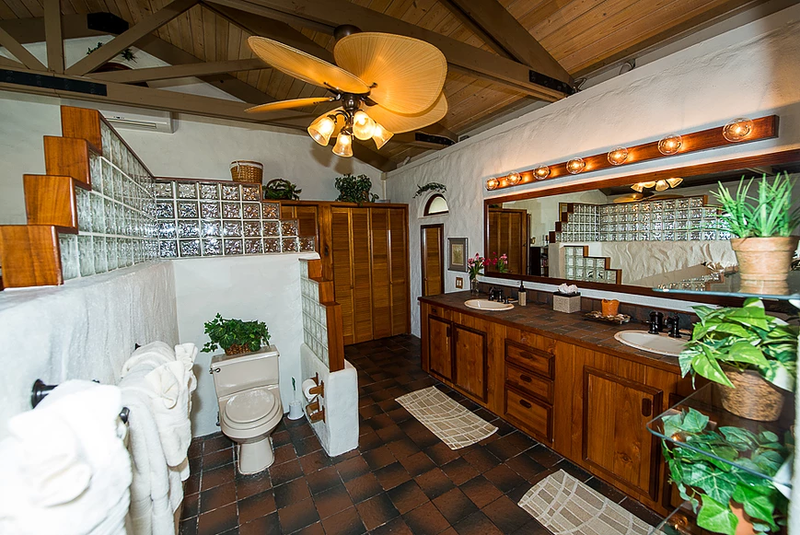 A comfortable lower south bedroom features a private outside entry with secluded deck area and water views of Hurricane Hole overlooking a small fishpond with waterfall. 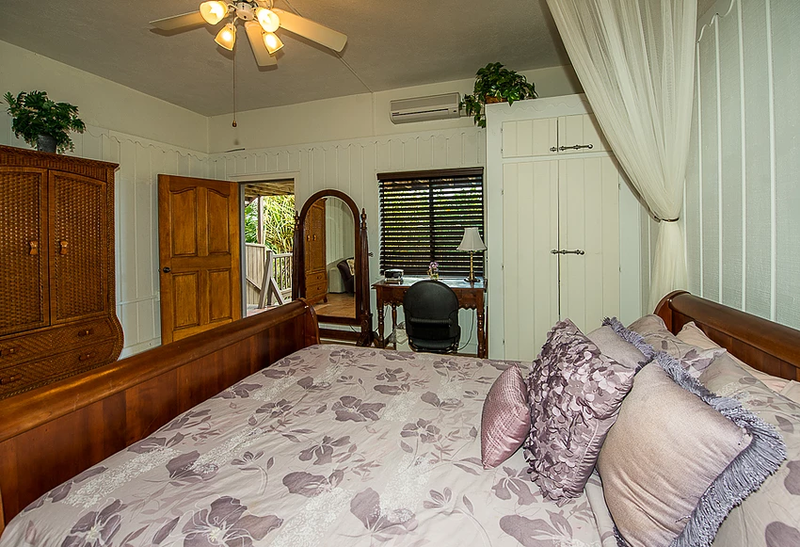 A queen size bed with private bathroom and shower area. 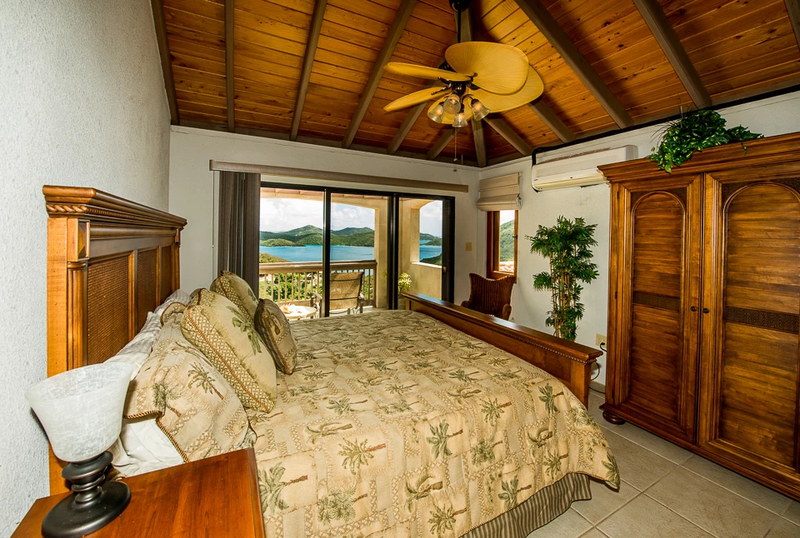 This spacious lower north bedroom features a private outside entry with a secluded deck and water views of Hurricane Hole.